To download the entire Invoices and Orders database choose: comma delimited file Excel file and select Save File. This order for goods was placed by George Washington to his agent Robert Cary and Company on September 20, 1759. During the colonial period, large-scale planters like George Washington participated in the consignment system in order to sell their tobacco and buy the goods that decorated their homes, outfitted their kitchens, and flourished in their gardens. George Washington and his peers consigned, or handed over, their agricultural surplus to agents in England like Robert Cary and Company in exchange for the credit they used to buy imported English products. 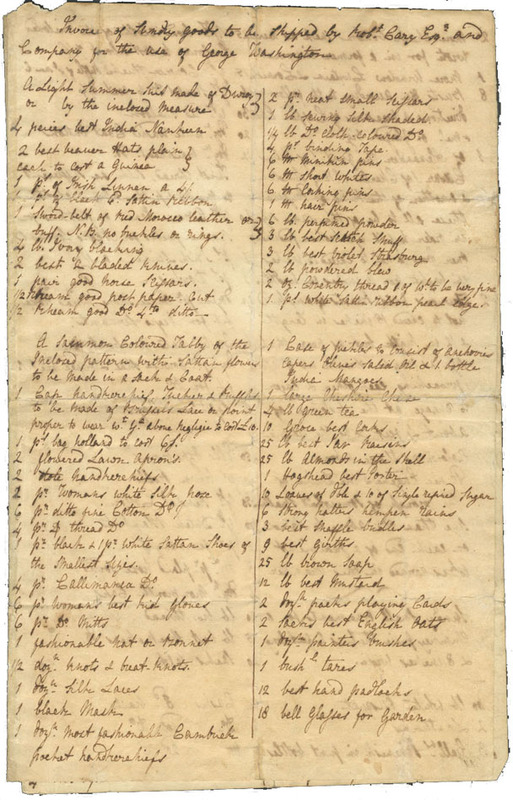 The Invoices and Orders Project, undertaken by Mount Vernon's Archaeology Department, facilitates the study of material culture, consumerism, and colonial economics by matching George Washington's individual orders for items with the return invoice. While quotations from George Washington's orders and invoices appear often in history books, we hope that this dataset will allow for an unprecedented opportunity to systematically examine and analyze a wealthy planter's material world through his purchases. 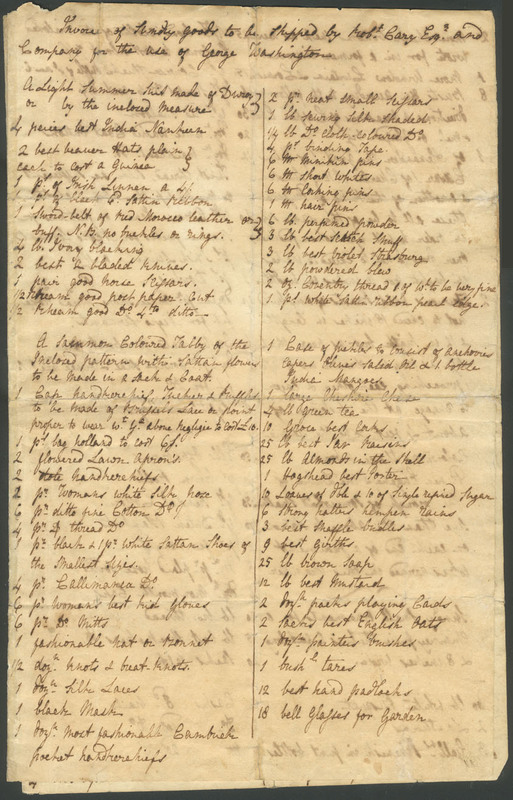 The dataset itself contains 3,839 items (including shipping fees associated with transporting the goods across the Atlantic Ocean), documenting a vast array of fabrics, seeds, medicines, shoes, foodstuffs, and plantation tools conveyed to Mount Vernon on 26 unique ships over the course of nearly 20 years, from 1754 to 1773. Some of the items were clearly intended for use by George and Martha Washington; others, like the coarse linen fabric called oznabrig, were destined for the growing community of enslaved individuals.